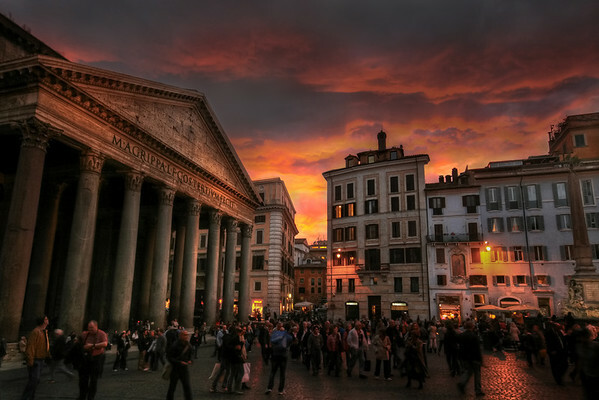 Pantheon is one of the most beautiful buildings I have seen and I was even rewarded with the most beautiful sunset. The photo is an old one, shot with my ancient Canon 400D. How to salvage an old photo? I took this photo as a single RAW on my old Canon 400D using a Sigma 10-20mm lens. I didn’t have a tripod, but the light was so gorgeous I just had to shoot the scene. What I did was to stand as still as I could and just fire away 20 shots hoping one would be sharp enough. The ISO I had turned up to 400, which is the highest acceptable ISO on that camera, and I the raised the f-stop to the highest value the lens allowed (lowest number). That gave me a shutter speed of 1/13 seconds, which requires a very steady hand. But I managed. In the processing had to major issues. I had to get a better balance between light and shadows and to increase the sharpness. To get better balance between the shadows and the light areas, I made a Pseudo HDR photo. To do that I made in Lightroom two artificial exposures by making virtual copies. One I made a -2 and the other I made +2. These to exposures I gave some strong noise reduction, and then I exported all three to Photomatix and tone mapped them. The result was awesome. Not as good as if I had shot three proper bracketed shots, but good enough. The sharpness I achieved by duplicating the layer in Photoshop and then applying a fairly strong Unsharp Mask (really a bad name for a sharpening rool). That did some really good things to the roof of the Pantheon. I blended in the good parts of the sharpened image – the rest I didn’t use. In the autumn we went to Karlskrona in Sweden with some of our friends. At night the clouds cleared and with no moon I took a few shots at the sky. I learned that when it is so dark, you can’t really focus. You have set the lens to manual focus mode, and then learn by heart where the focus ring must be positioned. 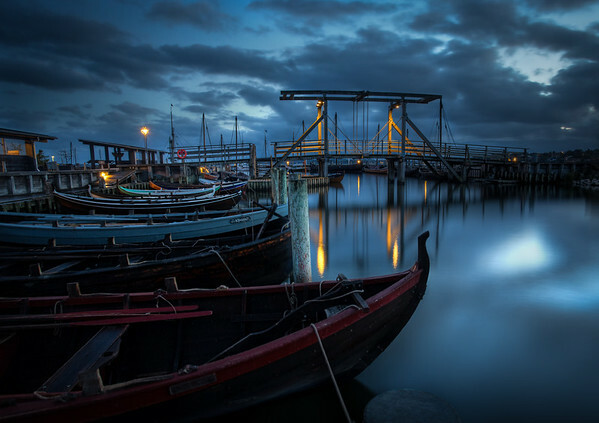 The photo consists of 9 HDR photos, but the sky comes from only one shot. The reason for that, is that the stars actually move surprisingly fast. 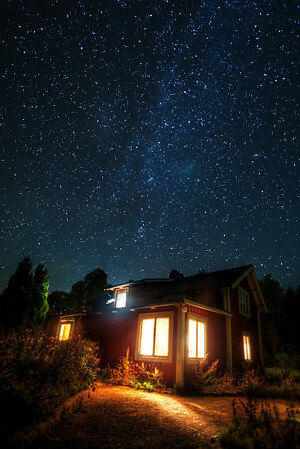 An exposure of more than 15 seconds, will show stars moving. It’s really fascinating. 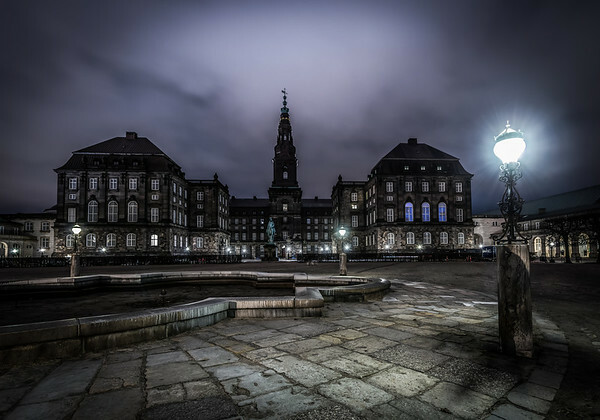 Right behind the Govermental building Christiansborg lies the Royal Stables. The Queen has got a set of white horses, which apparently are rare, if they have to be really white. The horses stays in the building in the left. 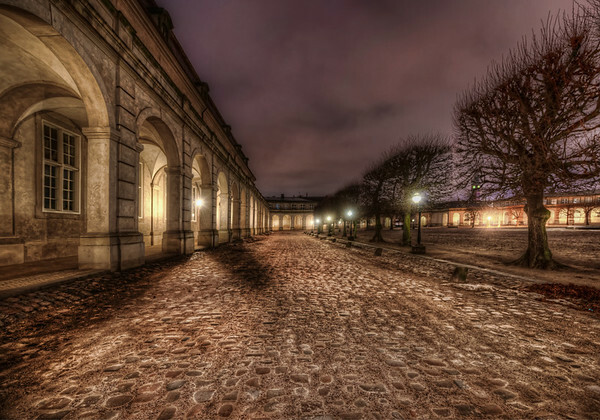 This is a typically double tone mapped HDR. I created it from 5 exposures in Photomatix. The double tone mapping gives this much more painterly and surreal style, which works well for some images. The idea of the double tone mapping is that, you first do one HDR photo and tone map it, and the image that you get from that process, you tone map too. This is done by pressing the “Tone mapping” button once more. A side effect of the double tone mapping is, that you get a lot more noise (grain) into the image. You have to clean some of it up, but not all. The noise adds some of the grittyness to the image, which is part of the effect. The second time you tone map, the colors go crazy, and you have to lower the saturation. The luminosity you also want to bring far down. Exactly how far depends on your photo. But this step is what creates the mood of your photo. Try some of the other sliders, and see how they affect your photo. I brought the double tone mapped image into Photoshop and did a lot of clean up and some noise reduction here. I took the sky from one of the original shots and masked that in. If you are unsure of how to mask/blend layers in Photoshop, have a look at my tutorial on blending layers. Not exactly a big great harbour bridge, but nevertheless I do like it. 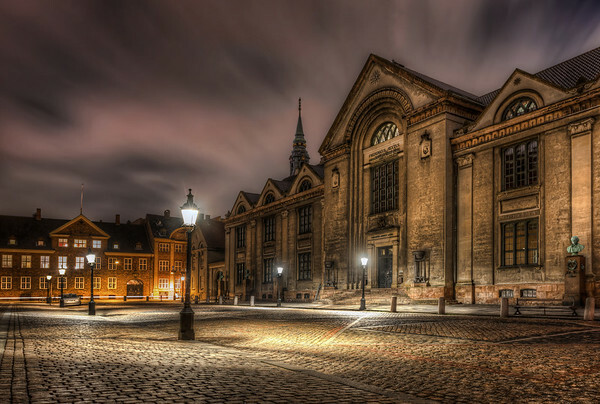 It connects the Museum Island, part of the Viking Museum here in Roskilde. The photo is a 5 shot HDR shot before sunrise. EXIF: 21mm, f/10, 5.0 sec. It was my aim to get the longest exposure to be a maximum of 30 seconds (which is the limit of the camera on automatic). I had to raise the ISO to 400, to keep the f/10 at a reasonable small value (higher number). I want the keep the f-stop low, to keep the foreground sharp as well. 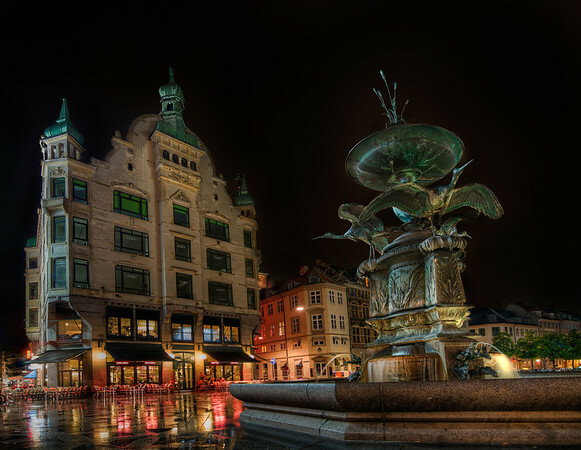 In the heart of Copenhagen lies the Fountain of the Storck. This is from the day that iPhone 5 was released in Denmark. All around the edges of this square people where standing in line with purple umbrellas and raincoats from Telia. About the photo itself. I have taken this with my Nikkor 14-24mm in rain at 14mm. This is very wide on a full frame camera (Nikon D800), but the objective was to make the fountain seem almost as large as the big building in the back. Processing wise I had some really nasty areas on the photo from the raindrops and I have had a lot of pain removing them. 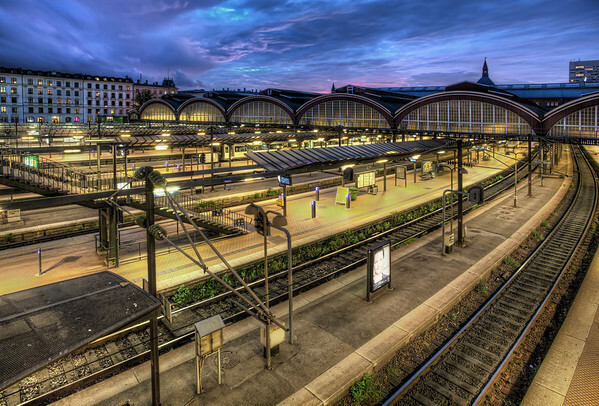 It is an HDR based on 5 images, but it is a fairly straight forward HDR. Being 14mm photo taken upwards, I had some pretty bad tilting lines, that I have work much on to straighten up. This is the main building of the University from 1836. The University has fostered a few known people, one of the more famous is Hans Christian Oersted, who discovered elektro magnitism in 1820. This particular photo I took on 22nd of December 2012. I have been waiting to take it, but the square in front is always crowded with people, busses, cars etc. But this day, only one single car was there. It’s a single RAW file that I have tonemapped to achieve this result. I rarely come by a central station that is as empty as this station, even at night time. I haven’t cloned anybody out or used multiple exposures to get rid of people or even waited for people to get out of the way. It just was empty – except for one single person (if you can find him). This is a 5 shot HDR taken with a small tripod handheld on the rails of the stairs. There are way too many bicycles to get room with a real tripod. Denmark is a bicycle nation, only surpassed by Holland, I think. Lake Tekapo in New Zealand lies in 700m above sea level. The lake it self is the oddest blue color, though you can’t see it at night. It sits very beautiful between snow covered mountains. Lake Tekapo and the observatory on top of Mount John (which is right behind me when I took the photo) is trying to become the worlds first UNESCO World Heritage Starlight Reserve. One criteria for that, is that all lamps point down, to avoid ‘light pollution’. 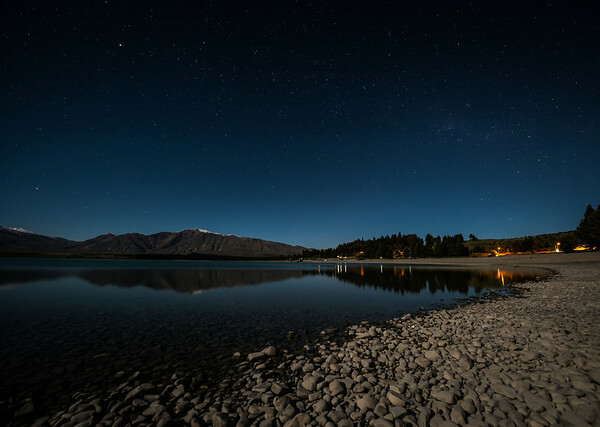 So I thought a night shot from Lake Tekapo was appropriate. 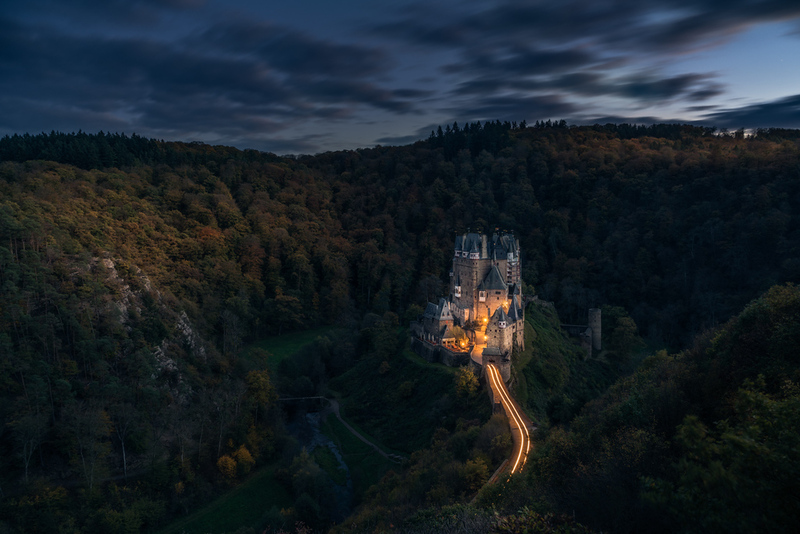 This shot is a single exposure taken during a full moon, which explains the light on the stones.